Sarah Cain (b. 1979, Albany, New York) pushes the limits of her discipline - the boundaries of painting - as she often expands beyond the two dimensional plane. Similar in scale and aesthetic to that of German artist Katharina Grosse, her expansive practice began in the nineties with site-specific works. Initially Cain worked with abandoned buildings as they offered her the necessary freedom to produce on a large and flexible scale. Her use of colour is distinctly bold and vibrant with patterns that are unpredictable and spontaneous whilst ordered and harmonious. Her approach is playful and imaginative as she uses colour, space and shapes to create disorientating perspectives as she works against the parameters of trial, risk and responsive experimentation. Wild Flower, Cain’s first solo show at the Mayfair gallery Timothy Taylor, includes nine new paintings, the interventions of a stained glass panel inserted into a central window and a large site specific work painted onto the gallery walls. Wild Flower references the resilience of uncultivated plants, ultimately highlighting the “latent tenacity” within Cain’s practice and the ways in which she perceives her relationship to abstract painting. I spoke to the L.A based artist about her current show and why she feels, as an artist, the word responsibility seems too reasonable when discussing the impracticality of committing your life to painting. Lara Monro: The title of your new show Wild Flower references the endurance of uncultivated plants and their prosperity to thrive in the harshest environment - this relates to your attitude towards abstraction and painting. Can you explain these ideas in more detail? 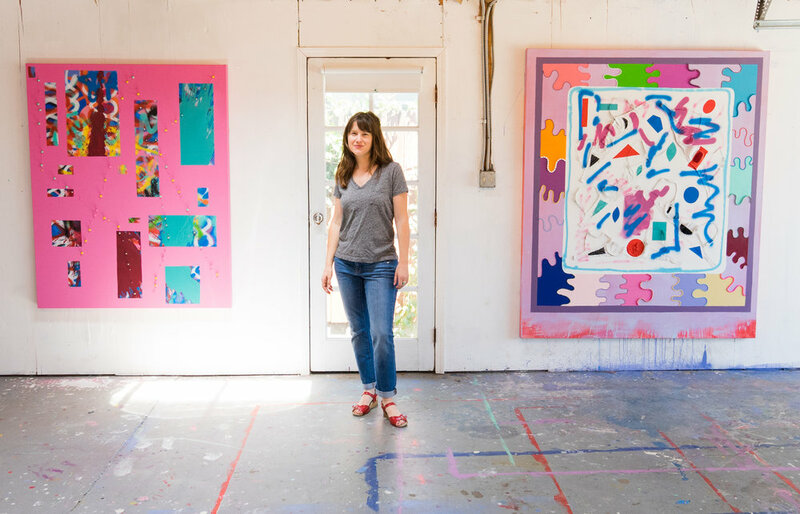 Sarah Cain: The way I work isn’t as narrative as that all sounds, its more feeling based. Wild Flower was the name of the last painting I completed for the show and ended up becoming the title. It felt right on various levels, like the way I’m bringing a new voice to abstraction or as a self-reflective view of how I am in the world. The way I paint is very experimental. I am always trying to break through to something new, it is also very persistent, it reminds me of the way a wildflower or weed will break through the sidewalk and claim its own space independent of where anyone else wants it to be. "The way I paint is very experimental. I am always trying to break through to something new, it is also very persistent, it reminds me of the way a wildflower or weed will break through the sidewalk and claim its own space independent of where anyone else wants it to be." 228.6 x 152.4 cm. Courtesy of the artist/Timothy Taylor Gallery. 152.4 x 121.9 cm. Courtesy of the artist/Timothy Taylor Gallery. Wild Flower is your first solo show in London - How would you compare the contemporary art scene in London to L.A - are there distinct differences for you? I wish I had more down time in London to get to know what’s going on locally. I don’t feel I can speak on it, and honestly so much has been changing in LA and I’m working all the time that I’m not totally up to date on what’s going on in LA. LA has a lot of different art scenes, and so many new spaces and people appearing all the time. I was told by multiple people (artists, curators, and gallerists) that London is a much smaller scene and it operates on a slower pace than the States. 182.9 x 152.4 cm. Courtesy of the artist/Timothy Taylor Gallery. I read an interview in which you explained; “Painting is a space where anything can happen but you need to be open to receiving it” - do you believe there is a partnership between the artist and blank canvas, a duel responsibility to create? I was speaking more about being an artist and living actively - being awake in the world. Being able to translate those experiences into the studio practice. I think once you give your life up to painting though there is a duel relationship, maybe responsibility, between your own studio and the world of painting. The word responsibility hits me in a way that feels off though, it sounds too reasonable for how impractical committing your life to painting actually is. "I think once you give your life up to painting though there is a duel relationship, maybe responsibility, between your own studio and the world of painting." From the 2016 exhibit Dark Matter at Galerie Lelong, New York. Courtesy of the artist/Galerie Lelong New York. 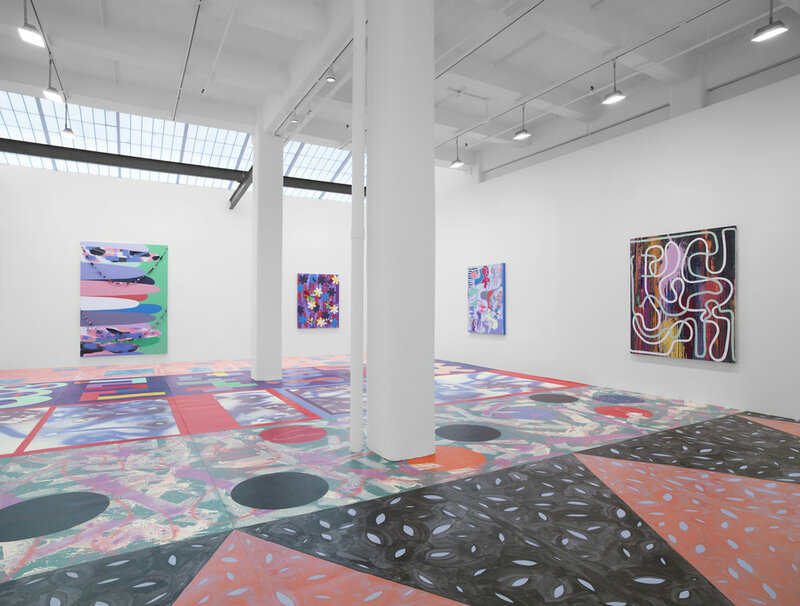 Your work is often site specific, as we see in your current show and that of your 2016 exhibition Dark Matter where you transformed the floor of Galerie Lelong. Can you tell me when this became such an integral part of your practice? I’ve been doing works on site since the late nineties. The site works came before the canvases and anything that could be seen as commercial. Originally, I would do them in abandoned buildings out of necessity because they offered a space of freedom. I like the back and forth between object and site, when both modes are shown together it makes all the works sort of hum in a way that takes some viewers longer to see on their own. What else will you be working on in 2018? I’m working on a solo with Honor Fraser in Los Angeles opening in Jan 2019. I’m also in production on a huge permanent site work - a 10 x 148 ft stained glass wall at the SF International Airport via a public art commission by the SF Arts Commission which opens April 2019. Soon I’ll be installing the floor you mentioned above at the Pizutti Collection in Columbus Ohio. I also have a handful of other works in shows. This week I’ve been deep in making new works on paper in this music sheet series I have been working on. Contributor, Lara Monro divides her time between working at White Cube Gallery as well as writing for Arteviste, Artsy and the Saatchi Magazine. Having studied Art History at Manchester, Lara has continued to explore the contemporary art scene in London and internationally. With a refined interest in modern and contemporary photographers, such as Mapplethorpe and Wojnarowicz, Lara reviews the most current photography exhibitions in London, New York and Paris.